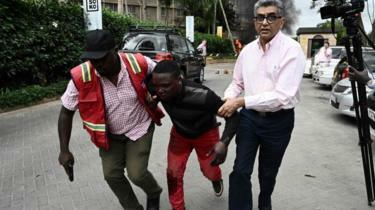 Kenyan President Uhuru Kenyatta has said that a siege by suspected militants in Nairobi is over and all the attackers have been “eliminated”. 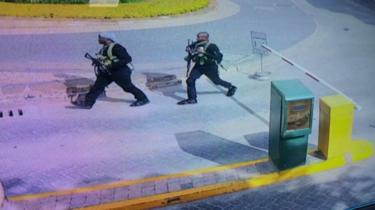 Gunmen attacked the compound in the Westlands district of Kenya’s capital on Tuesday, killing at least 14 people. 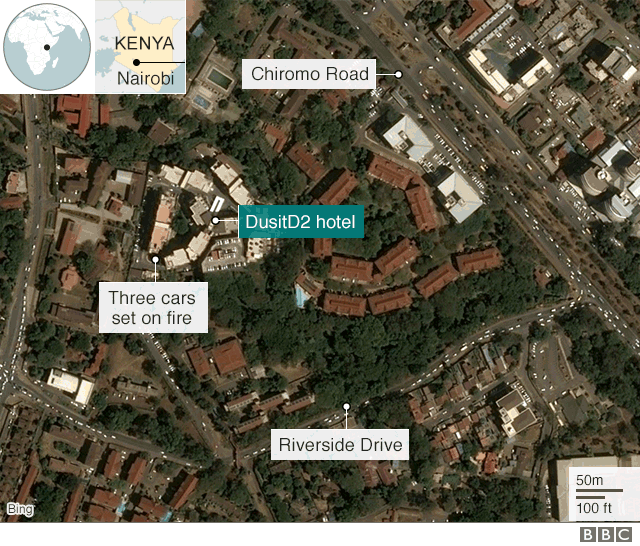 “I can now confirm that… the security operation at Dusit is over and all terrorists have been eliminated,” the Kenyan president said. “We will seek out every person that was involved in the funding, planning and execution of this heinous act,” he added, vowing to pursue them “relentlessly”. At 23:00, Interior Cabinet Secretary Fred Matiang’i said all the buildings in the complex had been secured by security forces. Security forces combed their way through the building where frightened workers had barricaded themselves inside, hiding under tables and chairs and in bathrooms. The attackers were reported to have retreated to the seventh floor, where more civilians were also thought to be hiding.